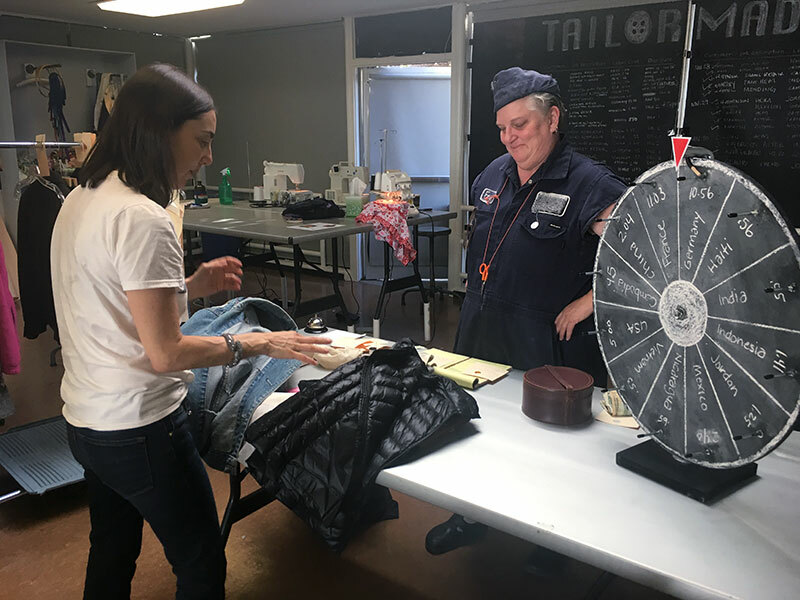 January 13, 2018, 11 am – 2 pm, the Sewing Rebellion will be hosted at Camera Obscura Art Lab in Santa Monica. The Sewing Rebellion – An economic tactic for change in the apparel industry. The Sewing Rebellion is a free workshop, which began @ Mess Hall, in Chicago Fall of 2006. It was hosted at Mess Hall for one year, before becoming itinerant in May 2007. The Sewing Rebellion is currently headquartered at the Institute 4 Labor Generosity Workers and UniformsILGWU, 322 Elm Ave, Long Beach Ca. Participants of the Sewing Rebellion are invited to emancipate themselves from the global garment industry by learning how to alter, mend and make their own garments and accessories! Hosted by Frau Fiber and an army of Faux Frau’s the Sewing Rebellion distributes knowledge of the garment industry, pattern making and sewing, encouraging the reuse, renovation and recycling of existing garments and textiles in the creation of unique items tailored to individual tastes and body shapes. Participants are asked to bring pants to mend, garments to alter, sewing problems which need solutions or and old piece of cloth to combat the use of plastic bags, by producing an East German shopping bag. Carole Frances Lung is a soft guerilla textile super hero. She is the” founder of the Institute 4 Labor Generosity Workers & Uniforms, Frau Fiber’s store front headquarters in downtown Long Beach, ca and an Associate Professor in Fashion Fiber Materials at California State University Los Angeles. Through her alter ego Frau Fiber, Carole utilizes a hybrid of playful activism cultural criticism, research, social and service design, crafting spirited durational performances engaging communities the human cost of mass production and consumption. Her work has been exhibited at Los Angeles Municipal Gallery, Craft in America Study Center, Maloof Foundation, Jane Addams Hull House Museum, Craft and Folk Art Museum, Center for Craft Creativity and Design, Museum of Contemporary Craft, OTIS College of Art and Design, Appalachian State University and the Ghetto Biennale Port Au Prince Haiti. Publications include: KCET Artbound, Surface Design Journal, Chicago Arts News, American Craft Council: Shaping the Future of Craft, Art in America, and Art Papers. She has lectured at Bauhaus University in Weimar Germany, The School of Art and Design Oslo, Norway, and Museum of Contemporary Art Denver. She has been awarded a Kohler Arts and Industry Residency, a Craft Creativity and Design Center Grant, At the Edge Gallery 400 award, Fred A. Hillbruner Artist Book Fellowship, CSULA creative leave (2014), creative mini grants (2013 and 2014) and in 2016 was awarded a Faculty Fellow for the Public Good grant and fellowship. Next Article The 2018 Global Cuisine Awards Celebrate Los Angeles Restaurants Felix, Spago, CUT by Wolfgang Puck, Mr. Chow, Howlin Rays, Odys + Penelope and more!